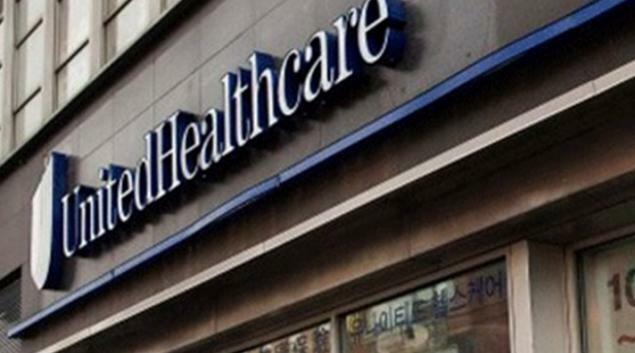 UnitedHealth reported strong first-quarter results. Markets are still fixated over the political uncertainties surrounding the sector. Despite beating Wall Street analyst expectations for the first quarter, shares of UnitedHealth (UNH) slumped after the report. What is the story value investors are missing? With attractive valuations, pitted against the general desire to avoid health care plan and drug store stocks, investors should look again at UNH's stock. UNH reported EPS GAAP of $3.56 as revenue rose 9.3% to $60.31 billion. The revenue beat by $500 million clearly demonstrates that the company’s prospects are getting clouded over the risks of the government passing Medicare for all citizens. Optum and UnitedHealthcare once again reported strong earnings. Net margin improved to 5.7% on earnings from operations of $4.8 billion. UNH even increased its 2019 adjusted EPS to $14.50-$14.75. Net income came in at $13.80-$14.05 a share. Cash flow of $3.2 billion is consistent with last year’s levels. Management noted strong return on equity at 26.8% and dividend payments growing 19.1% year over year to $860 million. UnitedHealth’s 7.5% weekly drop and nearly 25% from 52-week highs set last December 2018 appears irrational. The stock now trades below one times sales, while the forward P/E is below 15 times. Yet, with the strong shareholder returns, 23% earnings from operations from UnitedHealthcare, and its strong customer base, markets are ignoring the company’s upside potential. UnitedHealthcare Employer & Individual added 705,000 customers while UnitedHealthcare Medicare & Retirement added 405,000 more people in the first quarter compared to last year. Even UnitedHealthcare Global added 30,000 more people year on year. OptumHealth’s strong 16.6% revenue growth to $6.7 billion is a notable strength. The marketplace makes efficient use of market-leading information, data analytics, technology, and clinical insights. Its technology implementations will further drive the company’s profit growth for years to come. Operating margin of 7.1% is higher than last year’s levels but below the 9.8% reported at the end of Dec. 31, 2018. Still, the unit’s care delivery, behavioral health and health financial services grew in the quarter. OptumHealth’s customer base grew by 2 million to 93 million people. OptumInsight’s backlog grew 14.5% to $17.4 billion and is a positive contributor to the company’s results for the next few quarters. Last year, it acquired Advisory Board, which gives UNH the technology tools to advance. This includes artificial intelligence and value-based care. Building a common language against the disparate data is the first step. After that, it will apply metrics and measures to find patterns. AI will help the company analyze the information so that the unit may develop predictive insights. Wall Street analysts are highly optimistic on UNH's stock, with the average price target coming in at $301.80. If the stock is 40% below that, what is it that value investors are missing in the fair value number crunching? Investors could use an EBITDA Multiples Valuation model. 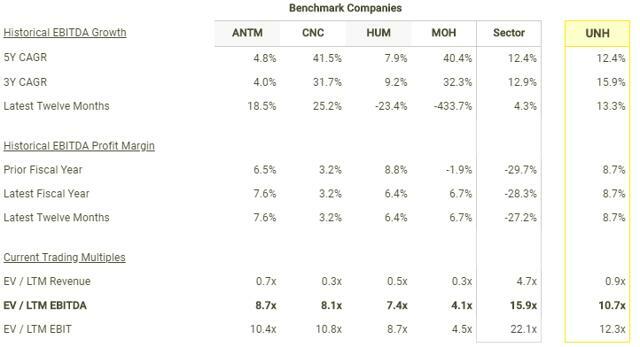 This compares operating metrics and valuation multiples of similar public companies to determine a value for the subject company. 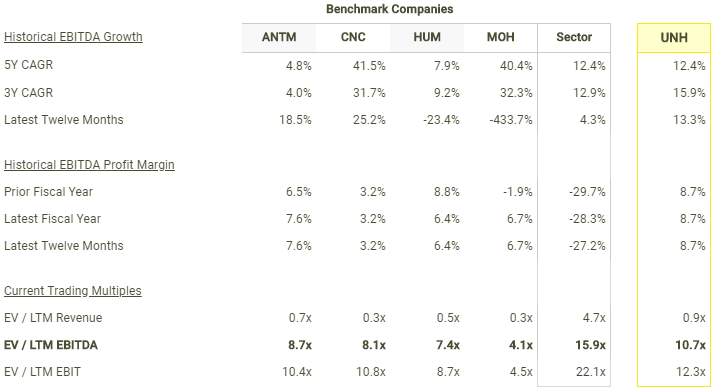 By comparing UnitedHealth to Humana Inc. (HUM), Molina Healthcare Inc. (MOH), Centene Corporation (CNC) and Anthem, Inc. (ANTM), assigning a modest EV/LTM EBITDA of below 11 times would lead to a fair value of between $246 and $287. The political headwinds threatening the health care plan sector may prove temporary. If the government ends up leaving the current plan alone, UNH and the others will rebound. Timing this turnaround is impossible. The most effective approach to booking the value is to start a small position in UNH's stock and to average into it over time. Even with the risks, UNH has strong fundamentals that will reward the value investor. Thank you for your time in reading this article. For a limited time, I am inviting you to sign up for risk-free trial access to DIY (do-it-yourself) investing. This invitation will close after reaching capacity. Please [+]Follow me for coverage on deeply-discounted healthcare stocks. Click on the "follow" button beside my name.